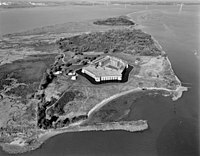 English: Fort Delaware — a Delaware State Park, located near Delaware City in New Castle County, Delaware. The 1859 Civil War fort is on the National Register of Historic Places in New Castle County. Media in category "Fort Delaware"
This page was last edited on 24 March 2019, at 16:12.